Although yellowjacket wasps are important biological control agents of a variety of pests, they may pose problems in nurseries in lunch areas, around garbage containers and on plants with ripe fruit. Yellowjacket defend their nests vigorously when disturbed, and they can sting nursery workers and customers visiting the nursery. This can be a serious safety issue because some people have a hypersensitive reaction to even a single sting. To control yellowjackets in the nursery, it is important that food, garbage and empty beverage cans are placed in containers with tight-fitting lids. Aerosol formulations of insecticides labeled for use on wasp and hornet nests can be effective against yellowjackets. However, these products must be used with extreme caution as wasps will attack if they sense a poison being applied to their nests. Moreover, timing of control is important since wiping out entire colonies of yellowjackets can be detrimental. A team of researchers from UC Riverside and the UC Cooperative Extension, Orange County are preparing for a fourth summer of monitoring and controlling the western yellowjacket, Vespula pensylvanica (fig. 1). This integrated pest management (IPM) research project is conducted in Irvine Regional Park (IRP) and the surrounding foothills, where high summer wasp populations pose problems each year for picnicking park visitors. Our goal is to demonstrate that minute quantities of insecticide can be used, not to wipe out entire colonies of yellowjackets, but to prevent painful confrontations with humans. To accomplish this, traps are routinely monitored and treatments are made only when the action threshold is reached; which minimizes the amount of pesticide used to reduce populations below the threshold level, and prevents exposure to nontarget organisms and the environment. Fig. 1. The western yellowjacket, Vespula pensylvanica. Photo by J. Kabashima. A chemical lure (heptyl butyrate) attracts workers and queens to the traps, where they tumble into jars of Sierra antifreeze coolant (propylene glycol) diluted with water (1:1, vol:vol). Traps are inspected every 7 to 14 days. The yellowjackets are counted and the number of wasps trapped per day is calculated; wasps are preserved in 95% ethyl alcohol for future molecular marker studies. The IPM project treats only when yellowjacket populations reach the action threshold of 10 wasps per day. When the action threshold is reached, a bait of 0.025% (wt/wt) fipronil and chicken breast is prepared and placed into bait stations. The bait stations are cages constructed from pine board and 1-inch hardware cloth, which allow wasps to pass through while keeping out nontarget organisms. Yellowjacket foragers carry the bait back to their nests.  (This is an experimental, not a legally registered use of fipronil). During the summer of 2013, 49 traps were hung in trees around the park perimeter and 7 in the park interior. Trap counts began climbing in late July, necessitating the only treatment of the season on August 1. A total of 10 bait stations were hung near the two traps where the action threshold was exceeded. Three bait cups containing 30 grams of 0.025% (wt/wt) fipronil and Swanson Premium Canned Chicken Breast were placed into each of the cages. During the 24-hour baiting period, the yellowjackets took 5.2 ± 0.7 grams (mean ± SEM, n = 30) of bait per cup. 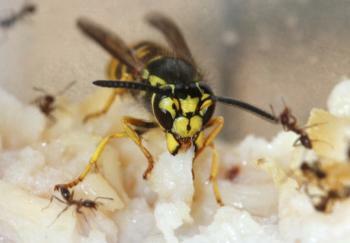 This means only 1.3 milligrams of fipronil were carried back to the yellowjacket nests. The impact of baiting was immediate: trap counts decreased throughout the park, not just in the treated areas, dropping from 337.2 wasps per day (sum of all 56 traps) on August 1 to 78 wasps per day on August 3 (fig. 2). Fig. 2. 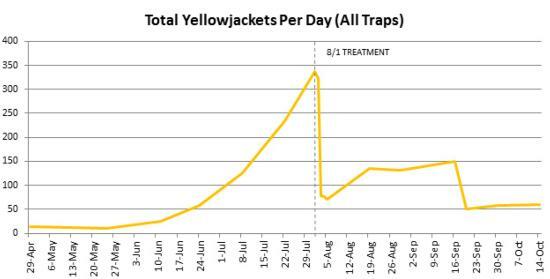 Total number of yellowjackets per day collected in 56 traps throughout the 2013 season. Dotted line indicates the timing of baiting trial conducted on August 1, 2013. We hope these positive results will encourage regulatory agencies and chemical companies to register similar control methods, and that treatment sites will include nurseries. For more information about managing yellowjackets, visit the UC IPM website at http://www.ipm.ucdavis.edu/PMG/PESTNOTES/pn7450.html. I would like to thank Monica Dimson, Staff Research Associate, for her assistance in preparing this article for UCNFA News.